Lambert Klaasz Aker, born 1616 at Hoorn and died 1690 in Harlingen, was a preacher of the Old Frisians or Jan Jacobsgezinden, first at Hoorn and later at Harlingen. He held fast to the use of the Biestkens Bible, whereas the newer Statenvertattng (state translation) had been adopted into general use among the Mennonites as well as the Reformed. Specific information about him is lacking. In Aanhangzel, the appendix by G. Maatschoen to Schijn's Geschiedenis der Mennoniten (Amsterdam,1745, 432), there is a portrait of Aker in copper etching. Zijpp, Nanne van der. 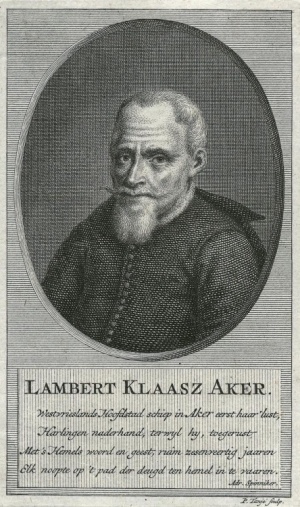 "Aker, Lambert Klaasz (1616-1690)." Global Anabaptist Mennonite Encyclopedia Online. 1955. Web. 20 Apr 2019. http://gameo.org/index.php?title=Aker,_Lambert_Klaasz_(1616-1690)&oldid=132241. Zijpp, Nanne van der. (1955). Aker, Lambert Klaasz (1616-1690). Global Anabaptist Mennonite Encyclopedia Online. Retrieved 20 April 2019, from http://gameo.org/index.php?title=Aker,_Lambert_Klaasz_(1616-1690)&oldid=132241. Adapted by permission of Herald Press, Harrisonburg, Virginia, from Mennonite Encyclopedia, Vol. 1, p. 28. All rights reserved. This page was last modified on 15 July 2015, at 19:18.